Churchill Towers is a complex of two towers in the Business Bay. 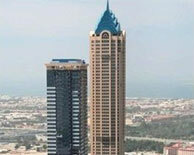 Churchill Residency is the taller tower standing at 245 m. It is a residential tower having 59 floors. The shorter tower is the Churchill Executive is commercial tower. It has 43 floors and stands at 172 m. The Construction of the projects has started in 2006 and was completed in 2010. Emirates National Investment is the developer of Churchill Towers. It's a center point where both high powered business come together with the harmony. It is a commercial center of excellence and a residential icon nestled in the region. Churchill Executive is a 42 floor of exclusive office spaces. A state of the art business support system is there to keep you well connected and networked at all times.